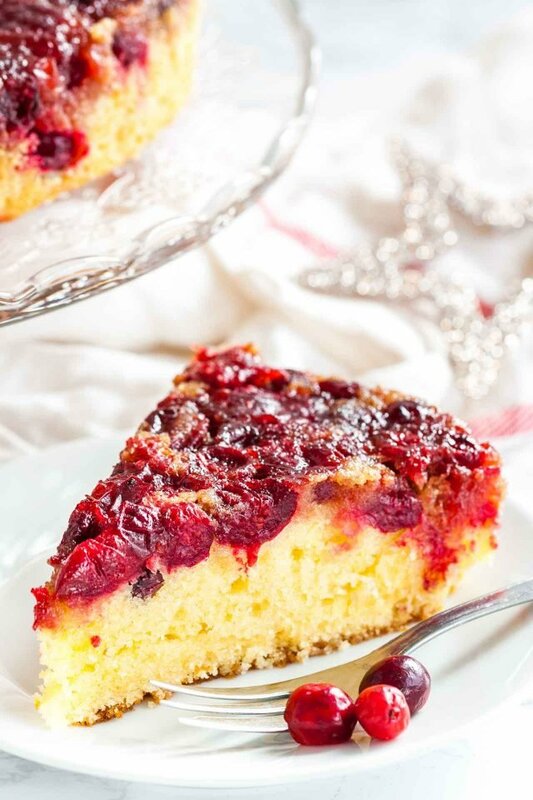 Cranberry Upside Down Cake - Perfect for the Holidays! 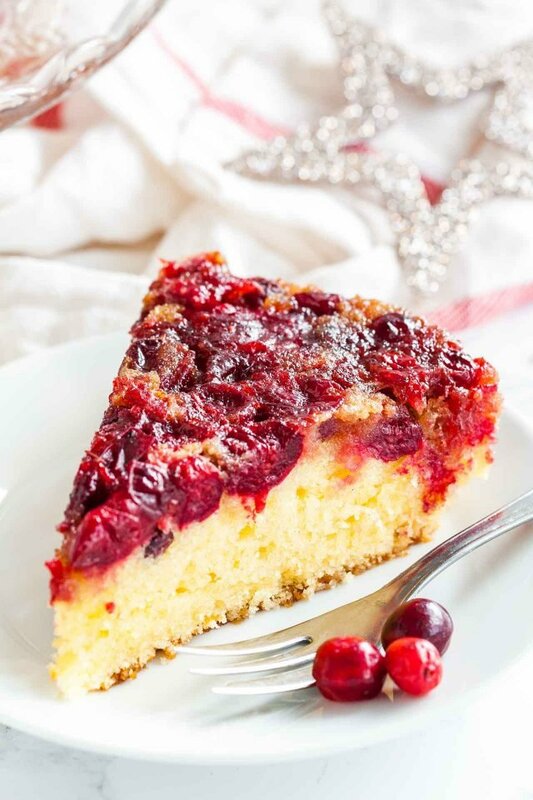 Cranberry Upside Down Cake has a perfectly balanced flavor and looks so festive and vibrant. A gorgeous cake made with fresh cranberries that’s perfect for the holidays! What we love about this cake is that it is super simple to make but looks spectacular when you serve it because of the caramelized cranberries on top. A perfect Holiday cake! If you are looking for the more Thanksgiving dessert we have a few to pick from like our Apple Crumble Pie, Pumpkin Crunch Cake, or Pecan Pie Cheesecake. 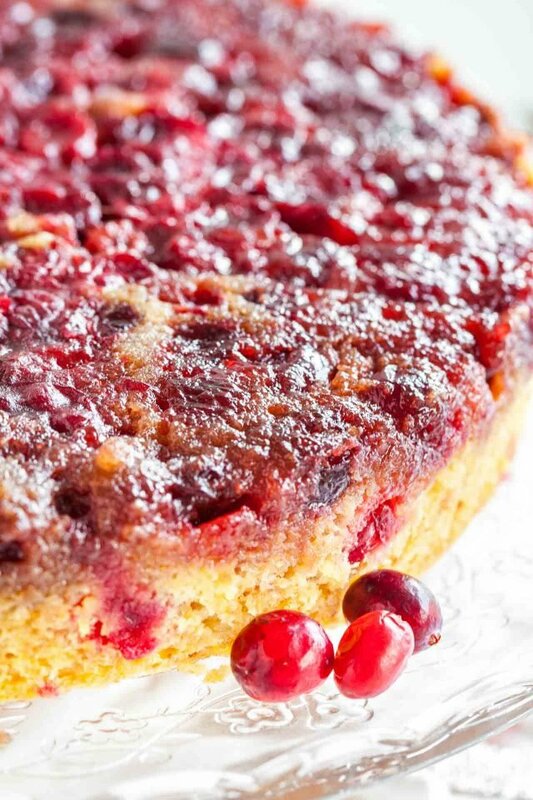 Cranberry Upside Down Cake is made with fresh cranberries, lemon zest, and a little bit of cinnamon! This cake is a stunning addition to your holiday menu that the whole family will love. 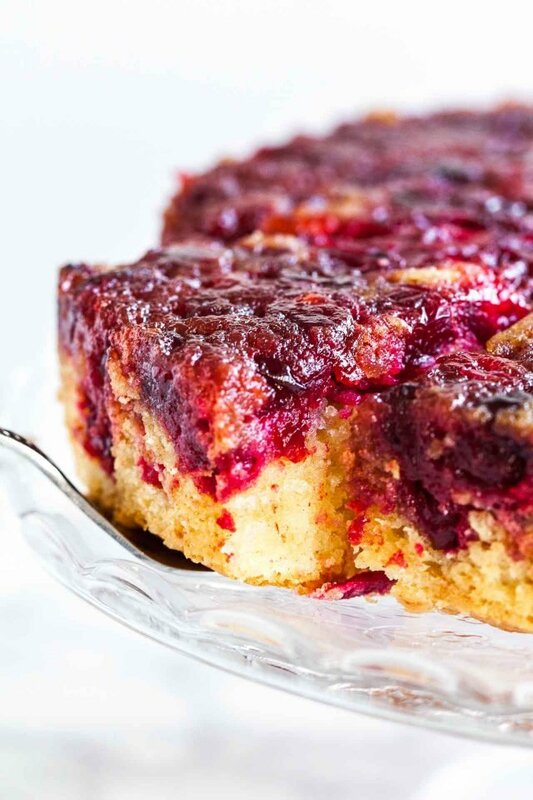 The slight tart flavor of the cranberries is perfectly balanced with the sweetness of the cake. Not too sweet, not too tart, just right! Searching for the perfect Christmas or Thanksgiving cake that’s easy to make from scratch, looks festive and tastes amazing? No need to keep looking this gorgeous Cranberry Cake checks all the boxes. 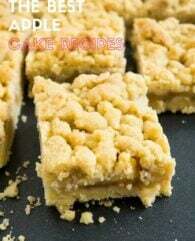 It’s delicious warm fresh from the oven but also tastes great at room temperature and the caramelized brown sugar cranberry topping adds so much flavor to this simple but so delicious cake. This moist and flavorful coffee cake is definitely a keeper! And it is SO easy. You’ll be glad you made it. Especially if you’re like me and the cranberry sauce is your favorite part of Thanksgiving dinner. You can use fresh or frozen cranberries for this cake. If using frozen cranberries thaw, rinse, and dry them before adding them to the pan. You need cake flour for this recipe! If you don’t have it at home you can easily make your own (see below). The batter will be pretty thick, it should not be runny. This way the cranberries will stay on the bottom of the pan and don’t float up during baking. If the cake browns too quickly cover it with foil the last few minutes of baking so it doesn’t get too brown. Don’t let the cake cool in pan for longer than 10 minutes or the syrup in the bottom of the pan will be too thick and it will be more difficult to get it out of the pan. This cake is best served warm but it also tastes great at room temperature. You can make it one day ahead and store it covered at room temperature (Don’t refrigerate it). To make cake flour from all-purpose flour, you measure one cup of all-purpose flour, remove two tablespoons flour from the cup and add 2 tbsp cornstarch. Sift the mixture two times to evenly distribute the cornstarch. 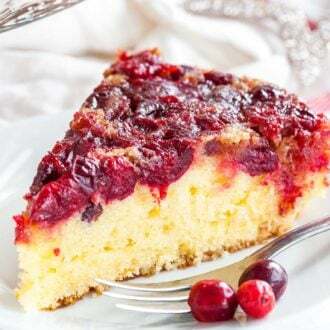 This Cranberry Upside-Down Sour Cream Cake would be perfect for Thanksgiving or Christmas but you don’t need a special occasion to bake it because it is easy and quick to make. I make it every year and even my husband who isn’t a big cake fan loves this sweet and tart cake. 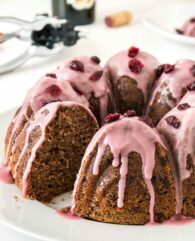 What to serve with Cranberry Coffee Cake? Homemade whipped cream would taste great with this cake! To make whipped cream, you need 1 cup cold heavy cream and 1 tbsp sugar. Place a metal mixing bowl and metal whisk into the freezer for 10 to 15 minutes, then put the sugar into the mixing bowl and add the whipping cream. Whisk just until the cream reaches stiff peaks. Don’t overwhip or you get butter not whipped cream! Store leftovers in an airtight container for up to 10 hours. Looking for more Holiday Dessert recipes? I love these cake pans! They are easy to clean and cakes bake evenly. These are perfectly sized for 9-inch round cake pans and save time. Watch the Video below to see how easy it is to make! Easy Cranberry Upside Down Cake has a perfectly balanced flavor and looks so festive and vibrant. A gorgeous cake made with fresh cranberries that's perfect for the holidays! Preheat oven to 350°F (180°C) and position the rack in the lower third of the oven. Butter the sides and bottom of a 9-inch springform or cake pan. Line the bottom of the pan with parchment paper and butter the paper. If using a springform pan wrap it tightly with foil. Put 4 Tbsp butter into the pan, transfer the pan to the oven and take it out when the butter is melted about 5 minutes. Add the brown sugar and cinnamon to the pan, stir well until combined, then spread the mixture evenly over the bottom of the pan. Distribute the cranberries evenly on top. Set aside. In the bowl of a stand mixer fitted with the paddle attachment cream the granulated sugar and remaining butter together at medium-high speed until pale and fluffy, about 4 minutes. Then add the eggs. Mix for 30 seconds on high speed until combined. Add sour cream, vanilla extract, salt, and lemon zest. Beat on medium speed until combined. Sift cake flour, baking powder, and baking soda into the batter and mix on low speed until just combined and no lumps remain. The batter will be thick. Spread the batter evenly over the cranberry mixture. Bake in the lower third of the oven for about 50-55 minutes, until a skewer comes out clean with only a few moist crumbs attached. Let the cake cool in the pan on a wire rack for 10 minutes. Then remove the ring of the springform or run a knife along the sides of the pan if using a normal pan. Invert the cake onto a serving plate and remove the bottom/pan. Make sure to watch the video above the recipe card before you make the cake! I show you every step so you get the best results. I love cranberries! Do you think I could substitute the cranberries for blueberries? Just looking for variations. Haven’t tried blueberries in this recipe but I think it will work. I would use fresh blueberries and not frozen/thawed ones because they are super moist. 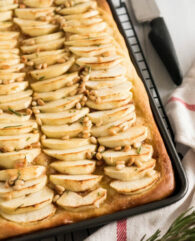 I love this twist on upside down cake! It’s perfect for Thanksgiving too! OMG, perfection. This looks so unbelievably good… maybe (dare I say it) better than your traditional Thanksgiving pie!? Yep, I went there.